The basic principles presented on our pages titled "About Solar Gain," "Window Selection Guidelines," and "Q&A on Window Replacement" apply to windows with after-market or retrofit plastic window films as well. The difference is that window films are generally a retrofit option, intended to fix a problem with excessive solar heat gain and/or solar glare from an existing window while window coatings are generally applied in a glass factory, usually in a large vacuum chamber. In order to get the right kind of window film for your window, look for the Visible Transmittance (VT) value for the film when applied to a single pane of clear glass. Then find the Solar Heat Gain Coefficient (SHGC) for the combination. If the VT value is greater than the SHGC value, you have the right kind of film for a hot climate window, but be sure to check the window manufacturer's warranty before applying the film. 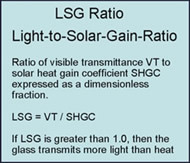 The Light-to-Solar-Gain (LSG) ratio is the VT value divided by the SHGC value. The higher this ratio, the more spectrally selective the film and the better it is for hot climates. 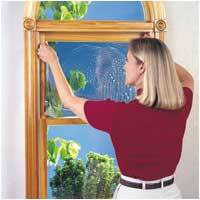 It is difficult, however, to achieve LSG values greater than about 1.2 with window films. Soft multi layer coatings inside double pane windows, however, can achieve values as great as 1.6, providing good transmission of visible light (no dark appearance) as well as good solar heat gain rejection. In order to achieve good solar heat rejection with either a window coating or an applied window film, the SHGC value needs to be low (below approximately 0.3 to 0.5) to be effective—the lower the better. With an LSG ratio of only 1.1, for example, this means that the visible transmittance (VT) value will be about 0.33 to 0.55. Low values in this range can impart a dark appearance to the glass and may be objectionable. For sunrooms with vast expanses of glass exposed to the direct sun for much of the day, however, values as low as 0.3 to 0.4 for the VT should not be objectionable, especially since these values can produce SHGC values below 0.3 to 0.4 with window films having LSG values greater than 1.0. The lightest LSG film is often made of metallic material or is otherwise reflective. The reason is that reflective films reflect the unwanted solar heat gain away from the window before it can be absorbed. Tinted or absorptive films block solar gain by absorbing it in the film, heating the film, and dissipating this heat to the inside and the outside of the room. Unfortunately, when applied to the inner surface of a window, much of this heat conducts, convects, and radiates to the interior, defeating much of the purpose for which the film was intended. Reflective films reduce the absorbed solar heat and reflect more of the blocked solar heat back outside. Unfortunately, many homeowners associations object to the use of shiny- or mirror-appearing coatings on the windows of homes in their jurisdiction. The reflecting value of a film is quantified by its visible reflectance (VR) value. The higher the reflectance, the shinier the window will appear. This is objectionable on the inside at night because the window looks more like a mirror than a window and during the daytime the same is true when viewed from the outside. If this is a potential problem for you, find the maximum value of the visible reflectance in your homeowner association's rules and make sure your window films do not exceed this value when applied to the inside surface of the window glass in your home. Fortunately, high-LSG window films should be available which achieve their solar heat gain rejecting properties by being highly reflective over the invisible infrared portion of the solar spectrum while being only slightly reflective over the visible portion of that spectrum. The consequence is that such films reject by reflection most of the invisible infrared heat radiation from the sun while passing most of the visible light. 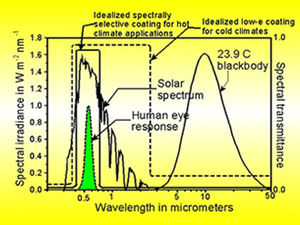 The infrared portion contains nearly half the heat of the solar spectrum, so reflecting all of this radiation would, by itself, reject almost half the solar heat gain while still permitting much of the visible light to pass through the window. This effect is more difficult to achieve with applied plastic window films than with multi layer coatings applied in a vacuum at the glass factory, which is why the latter generally achieve higher LSG values than can be found with plastic window films. When shopping for window films intended for residences in hot climates, insist on high LSG products, having values exceeding 1.0. Then look for the lowest SHGC value you can find in a film that is not objectionably dark to the eye. The human eye is very good at seeing small differences in brightness (illustrated by the differently tinted window panes in the photo to the left), but the eye is not that good at perceiving absolute brightness levels. The eye adapts to changing levels, and you can see just as well in a room illuminated with 1000 lux of light as in one having 1500 lux. The consequence is that a film sample held in the sales room or even placed over a window in the store may appear dark in comparison to the uncovered glass adjacent to it. But when it covers a large expanse of glass in your home, and there is no uncovered glass to compare it to, you might not be able to tell there is even a film on your windows! This makes it somewhat difficult to know from looking at samples in the store what film will be too dark for you when installed in your home. Perhaps the sales person has a room with window film on all the windows. If so, look at that room and decide if it is bright enough for you. Then ask the sales person what the visible transmittance is for that film. The room will appear darker on an overcast day than on a sunny one, and electric lighting can alter your perception of room brightness, so you may wish to make your observations with the electric lighting temporarily turned off. For moderately well shaded, vegetative exterior scenes, keep the visible transmittance (VT) value above about 0.45 to 0.55. For a bright, unshaded exterior scene, especially one with bright, highly reflecting surfaces in view outside the window, choose lower VT values, in the range from 0.25 to 0.4. Be careful with values at the lower end of this range. If the application is for a sunroom, the result might be too dark for you. For a sleeping room, however, the somewhat darker film can help avoid window-produced glare. For more on this subject, see our short glare tutorial. 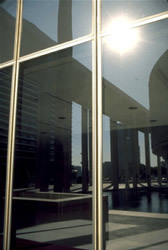 To obtain the highest LSG window films sometimes the resulting film has a slightly colored appearance. This color should not be evident when looking through the window from the inside, but it might be more obvious when looking at it from the outside. This is most likely a consequence of the manufacturer's efforts to achieve the high LSG ratio. By narrowing the spectral region through which solar radiation can pass to just the visible portion, sometimes light at the edges of the visible gets clipped, cutting out either some of the blue light or some of the red at the other end of the spectrum (or both). The best way to tell if this is objectionable when applied to the windows in your house is to place a fairly large film sample on your window and look at it from the outside. Try to look only at the patch of film sample in making your judgment. This way you are less likely to be biased by the subtle difference in color between the filmed and nonfilmed areas.